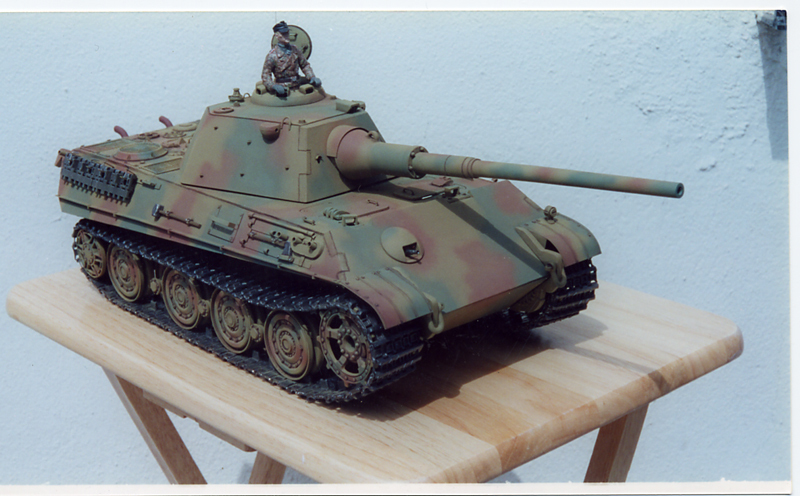 THE QUEST FOR TANK SUPREMACY: PANTHER II IN 1/16 SCALE. The endless thousands of Russian and American tanks that were thrown against the Germans were overwhelming, and only a tank with the ultimate capabilities and the utmost superior firepower would stop them, A high-tech armored force and the most advanced technological and scientific complex, German tank designers prepared for the high destiny of the quest for armored supremacy. In war, if you are not able to beat your enemy at his own game, it is nearly always better to adopt some striking variant. The Panther created records from the day of its inspired conception. German tank designers were long-term thinkers on a mission, for them it was an awesome privilege to be part of their field, they were risk takers, each one hand-picked to contribute to the success of their mission, and were willing to pay the price to conquer their dream, decisions were made that were consistently in line with their mission statement, they were possibility thinkers, and expected continuous and never-ending improvement that never crosses the finish line, ideas were treated very carefully, because they are the foundation of every great plan. The Panther II was a remarkable armored weapon ensemble, a space for the next generation of the Panther tank to start a new life. The Panther II project consisted of development of a new hull, chassis, and power train installation, and the design of a new turret, which became known as the �Schmalturm� (small turret) which was equipped with a stereoscopic rangefinder for the gunner, and a gyrostabilizer for both the sight and the gun. The Panther II holds a certain mystique for military historians, the battle tank that so nearly was, the tank that could have turned the tide for the Germans. The allies entering Germany found a treasure of new advanced weapons of all types, most of the new developments, however, had been much to late, and they served mainly to give the east-west �Cold War� competition a fine technological send-off. The western powers have accepted a grave responsibility, by weakening Germany only to give additional strength to Russia. It was clear for everyone to see that for the western powers, Bolshevism was their greatest enemy and that after an eventual victory over Germany it will be the same menace for them, as it was for Germany. The allied pact of the western democracies with the communist soviet union was nothing but a gigantic racket of rare vulgarity and hypocrisy, an imminent war was ready to break out from these once victorious allies now turned mortal enemies, armed with atomic weapons, as savage as one another, threatening to transform their own lands into incredible field of ruins. There was nothing to glory in unduly! The German Wehrmacht however, them, as the sons of Europe, were thinking of the life of Europe, and had fought for the true Europe of two thousand years of culture, its faith, and its civilization, it had reached the very height of sincerity and sacrifice, which the world has come to recognize the justice of its cause, and the purity of its gift. For hate dies, dies suffocated by its own stupidity and mediocrity, but grandeur is eternal, and the Panzerwaffe has lived in grandeur, cast in an epic which would never be extinguished.